Kerry Ellis and Matt Cardle will appear on stage together for the very first time at The Apex this month. Kerry is recognised as the leading lady of West End and Broadway musicals, with a number of starring roles in London, New York and around the world. Meanwhile Matt has become a multi-platinum recording artist, having completed five sold-out tours since winning The X Factor’s highest rating series in 2010, watched by over 19 million. Kerry began her assault on the West End in the early naughties with We Will Rock You, and was the first British Elphaba in the worldwide smash, Wicked, for which she won the award for ‘Best Takeover in a Role’ in 2008. She then took the role to Broadway for six months, where she won Broadway.com award for ‘Favourite Female Breakthrough Performance’, before returning to London in the role for a further six months. Her other leading role credits include Grizabella in Andrew Lloyd Webber's Cats, Nancy in Oliver!, Eliza Doolittle in My Fair Lady, Ellen in Miss Saigon and Fantine in Les Miserables. Brit Award nominee Matt has sold over 2.2 million records in the UK including hit singles Run For Your Life, Loving You and a cover of the timeless First Time Ever I Saw Your Face. His debut single, When We Collide, was recently named as one of the UK’s Top 40 biggest selling singles of the past decade and the No.1 best-selling single of the past century in Ireland. Matt is currently writing and recording his fourth studio album. Kerry last performed at The Apex to a sell-out crowd in October 2015 while Matt performed to a capacity crowd in July 2016. This is very much a homecoming show for the dynamic duo. Kerry was born and raised in Suffolk while Matt was born in Southampton, raised in Essex and his family now residing in Suffolk. Matt and Kerry met during a run of Broadway In Concert shows in 2016, where plans for this special duo show began. Matt Cardle & Kerry Ellis are at The Apex on Wednesday 23 and Thursday 24 August at 7.30pm. 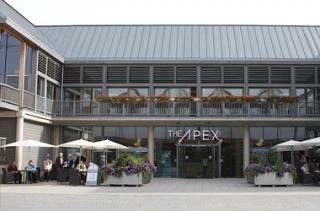 Tickets range from £27.50 to £40, ring the Box Office on 01284 758000, or visit www.theapex.co.uk for more information, or to book your tickets.